Ashford Traveller Spinning Wheel, Free Shipping & Gifts! The Traveller with scotch tension is a great little wheel that suits most spinners. 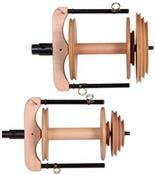 Like the Traditional you can buy "add on" kits that allow you to adapt the wheel to your specific spinning needs. If you collect the complete set of "add on" kits, you will have a wheel that will spin almost any type of yarn you can imagine. With the Traveller you also have the bonus of portability. The wheel has been designed to fit snuggly into the trunk of your car—or seat-belted in as a passenger, so it's easy to take it with you to workshops, and spin-ins. The wheel is made from solid New Zealand Silver Beech and comes complete with 4 bobbins, threading hook, learn to spin booklet, and built in lazy kate. The Traveller Spinning Wheel now comes with Double Treadle as standard. *We are not permitted to ship Ashford spinning wheels to ANY country outside the USA that has an Ashford distributor. Ask us if you are unsure. FREE SHIPPING!! (free standard shipping to USA lower 48 addresses only).